The Bolsheviks and Workers Control is a remarkable pamphlet by Maurice Brinton exposing the struggle that took place over the running of workplaces in the immediate aftermath of the Russian Revolution. In doing so not only does it demolish the romantic Leninist 'history' of the relationship between the working class and their party during these years (1917 - 21) but it also provides a backbone to understanding why the Russian revolution failed in the way it did. From this understanding flows alternative possibilities of revolutionary organisation and some 26 years after the original was written this is perhaps its greatest contribution today. For this reason alone this text deserves the greatest possible circulation today and we encourage you to link to it, download the text or otherwise circulate it. Today people as different as Young Liberals and Labour 'lefts', tired trade union officials and 'Trotskyists' of one kind or another - not to mention anarcho syndicalists and 'libertarian Marxists' - all talk about 'workers' control'. This suggests one of two things. Either these people have common objectives - which seems unlikely - or the words serve to mask as much as they convey. We hope to dispel some of the confusion by recalling how, at a critical stage of history, the advocates of different conceptions of 'workers' control' confronted one another and by showing who won, why they won, and what the consequences were to be. Thirdly - and far more difficult to see through - was the attitude of the Bolsheviks. 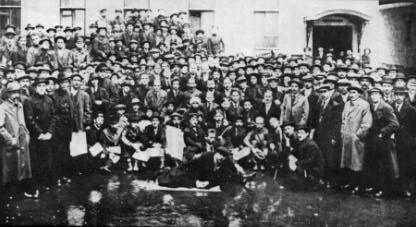 Between March and October the Bolsheviks supported the growth of the Factory Committees, only to turn viciously against them in the last few weeks of 1917. seeking to incorporate them into the new union structure, the better to emasculate them. This process, which is fully described in the pamphlet, was to play an important role in preventing the rapidly growing challenge to capitalist relations of production from coming to a head. Instead the Bolsheviks canalised the energies released between March and October into a successful onslaught against the political power of the bourgeoisie (and against the property relations on which that power was based). At this level the revolution was 'successful'. But the Bolsheviks were also 'successful' in restoring 'law and order' in industry law and order that re consolidated the authoritarian relations in production, which for a brief period had been seriously shaken. Why did the Party act in this manner? To answer this question would require a much fuller analysis of the Bolshevik Party and of its relation to the Russian working class than we can here attempt. Again one would have to steer clear both of mythology ('the great Bolshevik Party', 'the weapon forged by Lenin', 'the spearhead of the revolution', etc.) and of anti-mythology ('the Party as the embodiment of totalitarianism. militarism, bureaucracy,' etc. ), seeking constantly to understand rather than to rant or rave. At the superficial level both the Party's ideology and its practice were firmly rooted in the specific historical circumstances of Tsarist Russia, in the first decade of this century. illegality and persecution partly explain (although they do not justify) the Party's organisational structure and its conception of its relationship to the class. (6) What is more difficult to understand is the naivete of the Bolshevik leaders who don't seem to have appreciated the effects that this type of organisation and this type of relationship to the class would inevitably have on the subsequent history of the Party.